You have the right to life, liberty and the pursuit of happiness. After playing to sold-out crowds last summer and a successful NYC premiere in January, BOOTSTRAPS returns to North Carolina — a smarter, sharper, direct love letter to the painful contractions that are birthing a new America. After clawing their way to the top in pursuit of the “American Dream”, a white man and a white woman start to wonder whose backs they’re standing on. 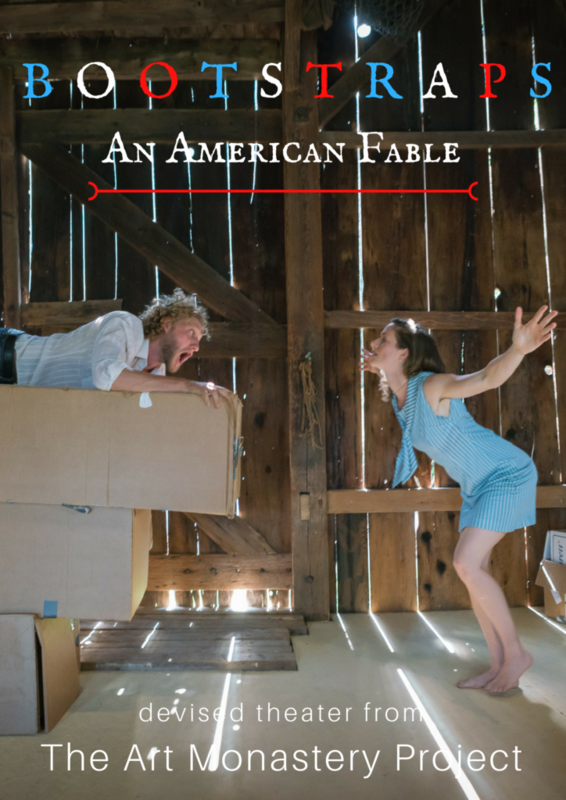 In tender silence, brutal slapstick and with soaring voices performers Kaitlin June and Raphael Sacks scour their own lived experiences to tell the story of white middle-class Americans building their lives while deconstructing their privilege. 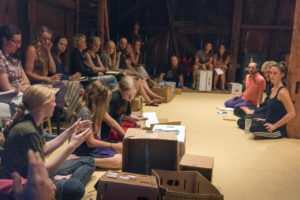 IN AUGUST 2017, BOOTSTRAPS: An American Fable toured Vermont, Massachusetts and North Carolina, with performances at the Art Monastery, the Springfield Community Players, Earthdance, Living Arts Collective, The Eco-Institute at Pickards Mountain, and the Culture Mill. Click here for some RESOURCES and NEXT STEPS in the Social Justice Activism behind our show. “I tell sincere white people, ‘Work in conjunction with us- each of us working among our own kind.’ Let sincere white individuals find all other white people they can who feel as they do- and let them form their own all-white groups, to work trying to convert other white people who are thinking and acting so racist. Let sincere whites go and teach non-violence to white people! … Working separately, the sincere white people and sincere black people actually will be working together. In our mutual sincerity we might be able to show a road to the salvation of America’s very soul. Wanna know more about this choice to focus the conversation on whiteness and white communities, when the big goal is actually inclusion and diversity? There are lots of resources out there. Two that have inspired us come from Constructive White Conversations (www.constructivewhiteconversations.org/) and Racial Equity Tools (www.racialequitytools.org/resourcefiles/whiteaffinitygroup.pdf). the right thing, all the while feeling there was no right thing to be done. A provocative and engaging blend of humor, distilled physical storytelling and deep, painful questioning. White fragility is about blindness and refusing to release that comfort. This performance allows us to identify and recognize our complicity. Thank you- it’s time to call systemic racism OUT!